To commemorate the event’s 70th year since it was first held in 1949, we are inviting ticket holders who turn 70 in April or May 2019 to join us for a special Birthday Tea Party on Friday 3rd May at Badminton at 3:30pm. Spaces for our special birthday guests will be limited but the lucky few will receive a pair of complimentary Members badges to access the Weatherbys Hamilton Badminton Members Enclosure with the Event Director and enjoy a toast to this special 70th milestone whilst enjoying a great view of the Main Arena. This party is being organised on a first come first served basis. 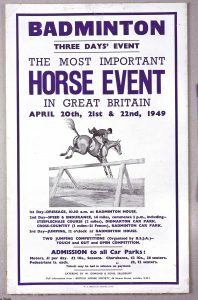 Applications to join the 70th Birthday Party must be made by email to nina.lloyd-jones@badminton-horse.co.uk by 31st March 2019. The name and date of birth of the ticket holder who will be celebrating the 70th birthday. The name of their plus one guest. Email address to which the e-tickets (which will be exchangeable for Member badges on arrival at Badminton) should be sent.